What is the event that comes once a year that everyone looks forward to… with dread? 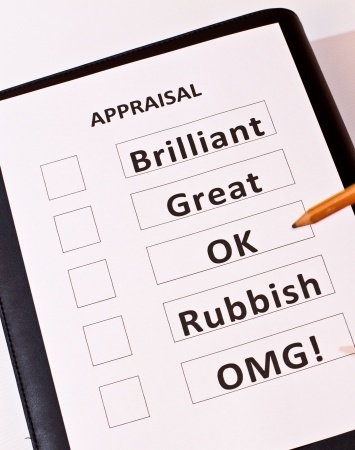 Performance Reviews. HR has to track down managers to do them. Managers have to try to put aside their subjectivity and bias – if they can – but also position their comments to keep employees motivated. But what is it that employees really want? According to the recent Workforce Mood Tracker Report issued by Globoforce, what a lot of them don’t want is the traditional performance review. Over 50% see their performance review as inaccurate, and say that their performance review does not motivate them to work harder. Why do people dislike reviews? 63% feel they are not a true indication of their performance, and 40% resent the fact that their review is based on a single point of view (their manager’s POV). Not surprisingly, the survey goes on to point out that those who ARE satisfied with their reviews are more highly engaged and satisfied with their jobs, and those who are not are 2X more likely to leave.